In the state curriculum for fourth grade, the kids have to study the three major landzones found in Utah: wetlands, forests and deserts. I knew that this would be easy to turn into an art project. 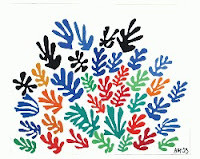 I first taught the students about Henri Matisse's paper collages. We looked at several images and talked about how his images were abstract. They REMIND us of birds, flowers, or marine plants without actually looking just like those things. Then I showed them several of Shiso Mama's paper collages. The kids really liked these, and they liked looking at work from a "real person." They really loved her intricate shapes, detailed cutting, and wonderful colors. Finally I had them sketch three small images based on the landzones. They could do close ups, entire scenes, or something really abstract, as long as they represented each landzone in some way. Todd helped me put together a DVD slide show of many images of the landzones and I just played that on a loop as inspiration for the kids as they drew. Finally they were allowed to select colored paper and put their mini collages together. When they finished, the kids mounted their collages (they are about 4 inches square) onto one long strip of paper as a triptych. I have to say that I was really impressed with their results. They were so good. These kids really caught the vision of this assignment and all of them got really into their projects. hello, i found that you linked to my blog, and i came and check out your project. i have to tell you that i am so honored and happy to see that you used my work in your class, and really impressed with the work that your students did! i am an art teacher as well, and I can imagine no higher compliment. thank you!